If you missed Lewis Black's book signing last Friday - you can still probably get a hold of an autographed copy if you swing by the Border's in Downtown Crossing. I went there on Saturday night to go look for a couple books on raising VC funding (yes, my Saturday nights are VERY exciting) and saw a rack of probably 30-40 autographed books right near the entrance. That's what you're looking for. The non-autographed ones I think were 30% off. But the autographed ones had an extra sticker on there and were only 20% off. I was going to pick up a copy for myself, but then I realized that I'm moving next week and one extra book that I buy now is an extra book that I have to box up and move. So, I put it back. 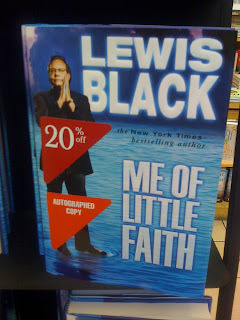 0 Response to "Autographed Copies of Lewis Black's Book"